Electrocardiography (ECG or EKG*) is the process of recording the electrical activity of the heart over a period of time using electrodes placed on the skin. These electrodes detect the tiny electrical changes on the skin that arise from the heart muscle's electrophysiologic pattern of depolarizing during each heartbeat. It is a very commonly performed cardiology test. 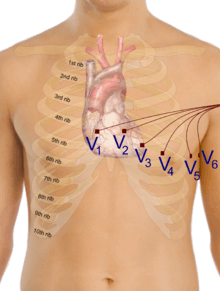 In a conventional 12-lead ECG, 10 electrodes are placed on the patient's limbs and on the surface of the chest. The overall magnitude of the heart's electrical potential is then measured from 12 different angles ("leads") and is recorded over a period of time (usually 10 seconds). In this way, the overall magnitude and direction of the heart's electrical depolarization is captured at each moment throughout the cardiac cycle. The graph of voltage versus time produced by this noninvasive medical procedure is referred to as an electrocardiogram. During each heartbeat, a healthy heart has an orderly progression of depolarization that starts with pacemaker cells in the sinoatrial node, spreads out through the atrium, passes through the atrioventricular node down into the bundle of His and into the Purkinje fibers, spreading down and to the left throughout the ventricles. This orderly pattern of depolarization gives rise to the characteristic ECG tracing. To the trained clinician, an ECG conveys a large amount of information about the structure of the heart and the function of its electrical conduction system. Among other things, an ECG can be used to measure the rate and rhythm of heartbeats, the size and position of the heart chambers, the presence of any damage to the heart's muscle cells or conduction system, the effects of cardiac drugs, and the function of implanted pacemakers. 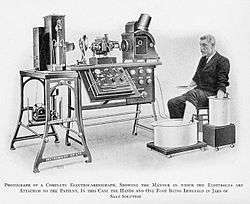 An initial breakthrough came when Willem Einthoven, working in Leiden, the Netherlands, used the string galvanometer (the first practical electrocardiograph) he invented in 1901. This device was much more sensitive than both the capillary electrometer Waller used and the string galvanometer that had been invented separately in 1897 by the French engineer Clément Ader. Einthoven had previously, in 1895, assigned the letters P, Q, R, S, and T to the deflections in the theoretical waveform he created using equations which corrected the actual waveform obtained by the capillary electrometer to compensate for the imprecision of that instrument. 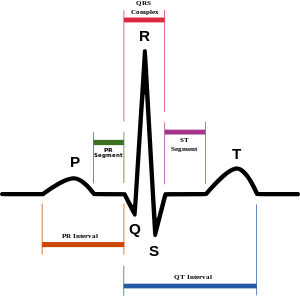 Using letters different from A, B, C, and D (the letters used for the capillary electrometer's waveform) facilitated comparison when the uncorrected and corrected lines were drawn on the same graph. Einthoven probably chose the initial letter P to follow the example set by Descartes in geometry. When a more precise waveform was obtained using the string galvanometer, which matched the corrected capillary electrometer waveform, he continued to use the letters P, Q, R, S, and T, and these letters are still in use today. Einthoven also described the electrocardiographic features of a number of cardiovascular disorders. In 1924, he was awarded the Nobel Prize in Medicine for his discovery. In 1937, Taro Takemi invented the first portable electrocardiograph machine. Continuous ECG monitoring is used to monitor critically ill patients, patients undergoing general anesthesia, and patients who have an infrequently occurring cardiac dysrhythmia that would be unlikely to be seen on a conventional ten second ECG. Performing a 12-lead ECG in the United States is commonly performed by specialized technicians that may be certified electrocardiogram technicians. ECG interpretation is a component of many healthcare fields (nurses and physicians and cardiac surgeons being the most obvious) but anyone trained to interpret an ECG is free to do so. However, "official" interpretation is performed by a cardiologist. Certain fields such as anesthesia utilize continuous ECG monitoring and knowledge of interpreting ECGs is crucial to their jobs. One additional form of electrocardiography is used in clinical cardiac electrophysiology in which a catheter is used to measure the electrical activity. The catheter is inserted through the femoral vein and can have several electrodes along its length to record the direction of electrical activity from within the heart.. 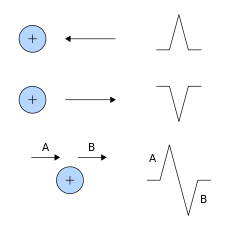 The fundamental component to electrocardiograph is the Instrumentation amplifier, which is responsible for taking the voltage difference between leads (see below) and amplifying the signal. 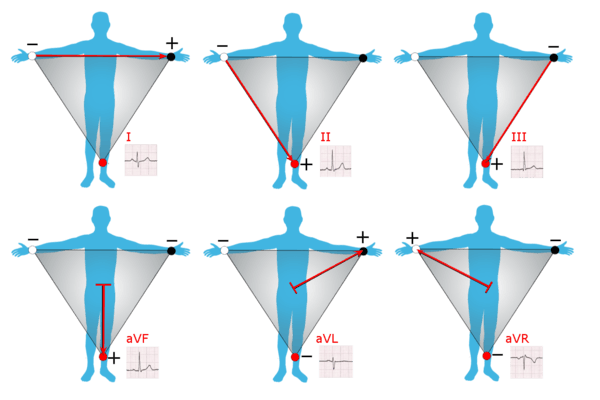 ECG voltages measured across the body are on the order of hundreds of microvolts up to 1 millivolt (the small square on a standard ECG is 100 microvolts). This low voltage necessitates a low noise circuit and instrumentation amplifiers are key. Early electrocardiographs were constructed with analog electronics and the signal could drive a motor to print the signal on paper. Today, electrocardiographs use analog-to-digital converters to convert to a digital signal that can then be manipulated with digital electronics. This permits digital recording of ECGs and use on computers. Safety features that include voltage protection for the patient and operator. Since the machines are powered by mains power, it is conceivable that either person could be subjected to voltage capable of causing death. Additionally, the heart is sensitive to the AC frequencies typically used for mains power (50 or 60 Hz). Defibrillation protection. Any ECG used in healthcare may be attached to a person who requires defibrillation and the electrocardiograph needs to protect itself from this source of energy. Additionally circuitry called the right leg driver can be used to reduce common-mode interference (typically the 50/60 Hz mains power). Typical design for a portable electrocardiograph is a combined unit that includes a screen, keyboard, and printer on a small wheeled cart. The unit connects to a long cable that branches to each lead which attaches to a conductive pad on the patient. Lastly, the electrocardiograph may include a rhythm analysis algorithm that produces a computerized interpretation of the electrocardiogram. The results from these algorithms are considered "preliminary" until verified and/or modified by someone trained in interpreting electrocardiograms. Included in this analysis is computation of common parameters that include PR interval, QT duration, corrected QT (QTc) duration, PR axis, QRS axis, and more. Earlier designs recorded each lead sequentially but current designs employ circuits that can record all leads simultaneously. The former introduces problems in interpretation since there may be beat-to-beat changes in the rhythm that makes it unwise to compare across beats. There is a careful distinction between "electrode" and "lead." An electrode is a conductive pad in contact with the body that makes an electrical circuit with the electrocardiograph. On a standard 12-lead EKG there are only 10 electrodes, which are listed in the table below. A lead is slightly more abstract and is the source of measurement of a vector. For the limb leads, they are "bipolar" and are the comparison between two electrodes. For the precordial leads, they are "unipolar" and compared to a common lead (commonly the Wilson's central terminal) and is described below. Leads are broken down into three sets: limb, augmented limb, and precordial. The 12-lead EKG has a total of three limb leads and three augmented limb leads arranged like spokes of a wheel in the coronal plane (vertical) and six precordial leads that lie on the perpendicular transverse plane (horizontal). In medical settings, the term leads is also sometimes used to refer to the electrodes themselves, although this is not technically a correct usage of the term, which complicates the understanding of difference between the two. The 12 leads in a 12-lead EKG are listed below. Two common electrodes used are a flat paper-thin sticker and a self-adhesive circular pad. The former are typically used in a single ECG recording while the latter are for continuous recordings as they stick longer. Each electrode consists of an electrically conductive electrolyte gel and a silver/silver chloride conductor. The gel typically contains potassium chloride — sometimes silver chloride as well — to permit electron conduction from the skin to the wire and to the electrocardiogram. Leads aVR, aVL, and aVF are the augmented limb leads. They are derived from the same three electrodes as leads I, II, and III, but they use Goldberger's central terminal as their negative pole which is a combination of inputs from other two limb electrodes. Additional electrodes may rarely be placed to generate other leads for specific diagnostic purposes. Right-sided precordial leads may be used to better study pathology of the right ventricle or for dextrocardia (and are denoted with an R (e.g., V5R)). Posterior leads (V7 to V9) may be used to demonstrate the presence of a posterior myocardial infarction. A Lewis lead (requiring an electrode at the right sternal border in the second intercostal space) can be used to study pathological rhythms arising in the right atrium. A standard 12-lead ECG report (an electrocardiograph) shows a 2.5 second tracing of each of the twelve leads. The tracings are most commonly arranged in a grid of four columns and three rows. 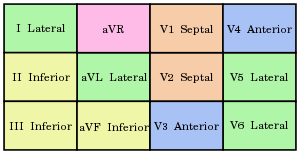 the first column is the limb leads (I,II, and III), the second column is the augmented limb leads (aVR, aVL, and aVF), and the last two columns are the precordial leads (V1-V6). Additionally, a rhythm strip may be included as a fourth or fifth row. Interpretation of the ECG is fundamentally about understanding the electrical conduction system of the heart. Normal conduction starts and propagates in a predictable pattern, and deviation from this pattern can be a normal variation or be pathological. It is a mistake to equate ECG with mechanical pumping activity of the heart. For example, pulseless electrical activity produces an ECG that should pump blood but no pulses are felt (and constitutes a medical emergency and CPR should be performed). Also consider ventricular fibrillation that produces an ECG but is too dysfunctional to produce a life-sustaining cardiac output. However, certain rhythms are known to have good cardiac output and some are known to have bad cardiac output. Ultimately, an echocardiogram or other anatomical imaging modality is useful in assessing the mechanical function of the heart. A note on "normal." Like all medical tests, what constitutes "normal" is based on population studies. For example, there is nothing intrinsically special about a heart rate between 60 and 100, but this range is considered "normal" because population data shows that most people without known heart problems have a resting heart rate in this range. Normal rhythm produces four entities — a P wave, a QRS complex, a T wave, and a U wave — that each have a fairly unique pattern. Finally, a full interpretation of the ECG should be performed in a methodical manner to avoid overlooking small details that may change the overall interpretation. This is similar to interpretation of radiological studies. 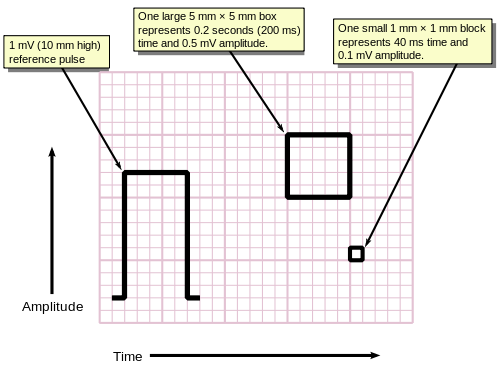 A small box is 1 mm x 1 mm big and represents 0.1 mV x 0.04 seconds. A large box is 5 mm x 5mm big and represents 0.5 mV x 0.2 seconds wide. In a normal heart, the heart rate is the rate in which the sinoatrial node depolarizes as it is the source of depolarization of the heart. Heart rate, like other vital signs like blood pressure and respiratory rate, change with age. In adults, a normal heart rate is between 60 and 100 beats per minute (normocardic) where in children it is higher. A heart rate less than normal is called bradycardia (<60 in adults) and higher than normal is tachycardia (>100 in adults). A complication of this is when the atria and ventricles are not in synchrony and the "heart rate" must be specified as atrial or ventricular (e.g., atrial rate in atrial fibrillation is 300–600 bpm, whereas ventricular rate can be normal (60–100) or faster (100–150)). Once sinus rhythm, or not, is established the second question is the rate. For a sinus rhythm this is either the rate of P waves or QRS complexes since they are 1-to-1. If the rate is too fast then it is sinus tachycardia and if it is too slow then it is sinus bradycardia. The heart has several axes, but the most common by far is the axis of the QRS complex (references to "the axis" implicitly means the QRS axis). Each axis can be computationally determined to result in a number representing degrees of deviation from zero, or it can be categorized into a few types. The QRS axis is the general direction of the ventricular depolarization wavefront (or mean electrical vector) in the frontal plane. It is often sufficient to classify the axis as one of three types: normal, left deviated, or right deviated. Population data shows that normal QRS axis is from −30° to 105° with 0° being along lead I and positive being inferior and negative being superior (best understood graphically as the hexaxial reference system). Beyond +105° is right axis deviation and beyond −30° is left axis deviation (the third quadrant of −90° to −180° is very rare and is an indeterminate axis). A shortcut for determining if the QRS axis is normal is if the QRS complex is mostly positive in lead I and lead II (or lead I and aVF if +90° is the upper limit of normal). The extent of normal axis can be +90° or 105° depending on the source. Ischemia or non-ST elevation myocardial infarctions may manifest as ST depression or inversion of T waves. It may also affect the high frequency band of the QRS. Distortion poses significant challenges to healthcare providers, who employ various techniques and strategies to safely recognize these false signals. Accurately separating the ECG artifact from the true ECG signal can have a significant impact on patient outcomes and legal liabilities. Improper lead placement (for example, reversing two of the limb leads) has been estimated to occur in 0.4% to 4% of all EKG recordings, and has resulted in improper diagnosis and treatment including unnecessary use of thrombolytic therapy. Numerous diagnosis and findings can be made based upon electrocardiography and many are discussed above. The following is an organized list of these and more. * The version with -K-, which is rarer in British English than in American English, is an early-20th-century loanword from the German acronym EKG for Elektrokardiogramm (electrocardiogram), which reflects that German physicians were pioneers in the field at the time. Today AMA style and, under its stylistic influence, most American medical publications use ECG instead of EKG. The German term Elektrokardiogramm as well as the English equivalent electrocardiogram consist of the New Latin/international scientific vocabulary elements elektro- (cognate electro-) and kardi- (cognate cardi-), the latter from Greek kardia (heart). The -K- version is more often retained under circumstances where there may be verbal confusion between ECG and EEG (electroencephalography) due to similar pronunciation. ↑ "ECG- simplified. Aswini Kumar M.D.". LifeHugger. Retrieved 11 February 2010. ↑ Braunwald E. (ed) (1997), Heart Disease: A Textbook of Cardiovascular Medicine, Fifth Edition, p. 108, Philadelphia, W.B. Saunders Co.. ISBN 0-7216-5666-8. ↑ Waller AD (1887). "A demonstration on man of electromotive changes accompanying the heart's beat". J Physiol (Lond). 8 (5): 229–34. PMC 1485094 . PMID 16991463. ↑ Rivera-Ruiz M, Cajavilca C, Varon J (29 September 1927). "Einthoven's String Galvanometer: The First Electrocardiograph". Texas Heart Institute journal / from the Texas Heart Institute of St. Luke's Episcopal Hospital, Texas Children's Hospital. 35 (2): 174–8. PMC 2435435 . PMID 18612490. 1 2 3 Hurst JW (3 November 1998). "Naming of the Waves in the ECG, With a Brief Account of Their Genesis". Circulation. 98 (18): 1937–42. doi:10.1161/01.CIR.98.18.1937. PMID 9799216. 1 2 3 4 5 Masters, Jo; Bowden, Carole; Martin, Carole (2003). Textbook of veterinary medical nursing. Oxford: Butterworth-Heinemann. p. 244. ISBN 0-7506-5171-7. ↑ Moyer VA (2 October 2012). "Screening for coronary heart disease with electrocardiography: U.S. Preventive Services Task Force recommendation statement.". Annals of Internal Medicine. 157 (7): 512–8. doi:10.7326/0003-4819-157-7-201210020-00514. PMID 22847227. ↑ "Summary of Medical Standards" (PDF). U.S. Federal Aviation Administration. 2006. Retrieved 27 December 2013. ↑ "Mitigation Strategies for ECG Design Challenges" (PDF). Analog Devices. Retrieved 24 April 2016. ↑ "Electrocardiogram Leads". CV Physiology. 26 March 2007. Retrieved 15 August 2009. ↑ Kavuru, Madhav S.; Vesselle, Hubert; Thomas, Cecil W. (1987). "Advances in Body Surface Potential Mapping (BSPM) Instrumentation". Pediatric and Fundamental Electrocardiography. Developments in Cardiovascular Medicine. 56: 315–327. doi:10.1007/978-1-4613-2323-5_15. ISBN 978-1-4612-9428-3. ISSN 0166-9842. ↑ "Lead Placement". Univ. of Maryland School of Medicine Emergency Medicine Interest Group. Archived from the original on 20 July 2011. Retrieved 15 August 2009. ↑ "Limb Leads – ECG Lead Placement – Normal Function of the Heart – Cardiology Teaching Package – Practice Learning – Division of Nursing – The University of Nottingham". Nottingham.ac.uk. Retrieved 15 August 2009. 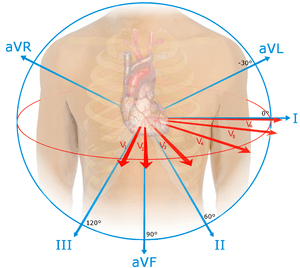 ↑ "Lesson 1: The Standard 12 Lead ECG". Library.med.utah.edu. Archived from the original on 22 March 2009. Retrieved 15 August 2009. ↑ "Electrocardiogram explanation image". Retrieved 28 February 2014. ↑ Meigas, K; Kaik, J; Anier, A (2008). "Device and methods for performing transesophageal stimulation at reduced pacing current threshold". Estonian Journal of Engineering. 57 (2): 154. doi:10.3176/eng.2008.2.05. 1 2 Pehrson, Steen M.; Blomströ-LUNDQVIST, Carina; Ljungströ, Erik; Blomströ, Per (1994). "Clinical value of transesophageal atrial stimulation and recording in patients with arrhythmia-related symptoms or documented supraventricular tachycardia-correlation to clinical history and invasive studies". Clinical Cardiology. 17 (10): 528–534. doi:10.1002/clc.4960171004. PMID 8001299. ↑ Surawicz, Borys; Knillans, Timothy (2008). Chou's electrocardiography in clinical practice : adult and pediatric (6th ed.). Philadelphia, PA: Saunders/Elsevier. p. 12. ISBN 1416037748. ↑ Houghton, Andrew R; Gray,D avid (2012). Making Sense of the ECG, Third Edition. Hodder Education. p. 214. ISBN 978-1-4441-6654-5. ↑ Segura-Sampedro, Juan José; Parra-López, Loreto; Sampedro-Abascal, Consuelo; Muñoz-Rodríguez, Juan Carlos (2015). "Atrial flutter EKG can be useless without the proper electrophysiological basis". International Journal of Cardiology. 179: 68–9. doi:10.1016/j.ijcard.2014.10.076. PMID 25464416. 1 2 Takla, George; Petre, John H.; Doyle, D John; Horibe, Mayumi; Gopakumaran, Bala (2006). "The Problem of Artifacts in Patient Monitor Data During Surgery: A Clinical and Methodological Review". Anesthesia & Analgesia. 103 (5): 1196. doi:10.1213/01.ane.0000247964.47706.5d. ↑ Kligfield, Paul; Gettes, Leonard S.; Bailey, James J.; Childers, Rory; Deal, Barbara J.; Hancock, E. William; van Herpen, Gerard; Kors, Jan A.; Macfarlane, Peter (2007-03-13). "Recommendations for the standardization and interpretation of the electrocardiogram: part I: The electrocardiogram and its technology: a scientific statement from the American Heart Association Electrocardiography and Arrhythmias Committee, Council on Clinical Cardiology; the American College of Cardiology Foundation; and the Heart Rhythm Society: endorsed by the International Society for Computerized Electrocardiology". Circulation. 115 (10): 1306–1324. doi:10.1161/CIRCULATIONAHA.106.180200. PMID 17322457. ↑ Jafary, Fahim H (2007). "The "incidental" episode of ventricular fibrillation: A case report". Journal of Medical Case Reports. 1: 72. doi:10.1186/1752-1947-1-72. PMC 2000884 . PMID 17760955. ↑ Mangalmurti, Sandeep; Seabury, Seth A.; Chandra, Amitabh; Lakdawalla, Darius; Oetgen, William J.; Jena, Anupam B. (2014). "Medical professional liability risk among US cardiologists". American Heart Journal. 167 (5): 690. doi:10.1016/j.ahj.2014.02.007. PMID 24766979. ↑ Chanarin, N., Caplin, J., & Peacock, A. (1990). “Pseudo reinfarction”: a consequence of electrocardiogram lead transposition following myocardial infarction. Clinical cardiology, 13(9), 668–669. ↑ Guijarro-Morales, A., Gil-Extremera, B., & Maldonado-Martín, A. (1991). ECG diagnostic errors due to improper connection of the right arm and leg cables. International Journal of Cardiology, 30(2), 233–235. ↑ Merriam-Webster. "Merriam-Webster's Collegiate Dictionary". Merriam-Webster.